Peasedown party grant scheme to give away another £500! A popular community festival that has achieved record success over the last eleven years has re-opened its grant scheme to give money back to the community. Peasedown St John’s Party in the Park is held every summer on Beacon Field, and due to the success of the tenth event last year, thousands of pounds was raised. The majority of the money will go towards funding Party in the Park 2019 this summer, but the organisers have set an amount aside – the Party in the Park Grant Fund, to reinvest back into the village in the form of small and medium-sized financial grants. Since the scheme was set up in 2010 almost £15,000 has been given away to organisations such as Wansdyke Play Association, Peasedown Primary School, The Community Bus, Peasedown Methodist Church, Little Treasures Toy Library, Peasedown Youth Albion FC, Peasedown In Bloom, Bath All Starz, Peasedown Wellbeing Group, Chess in Schools, Peasedown Residents’ Association, Peasedown Croquet Club, Laurel Farm Kindergarden and the local scouts. And now, event organisers are pleased to announce they’re giving away another £500 again this year, as part of their 11th anniversary celebrations. Local organisations can apply for funding themselves, or be nominated by a third party. To qualify for a Party in the Park Grant, applicants must be part of an organisation that’s either based in Peasedown St John or has beneficiaries in the community that will directly benefit from the funding. The organisation should be not-for-profit, a registered charitable trust, or seeking funding for one-off costs that cannot be met from their existing finances. Preference will be given this year to groups and individuals who haven’t applied before. 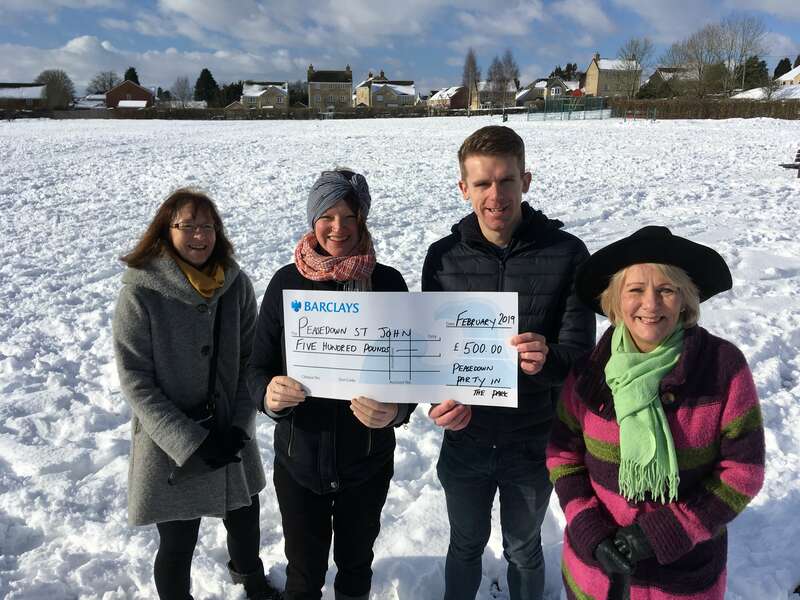 The 2019 Grant Fund was launched last Saturday morning on Beacon Field, despite the snow! Successful grant applicants will be congratulated in front of a packed festival crowd at Party in the Park 11 on Saturday 8th June on Beacon Field, Peasedown St John.